“The style which no one has ever seen before, artistry and safety.” I came up with those big aims. Next, I made a schematic plan at half size and settled the position of the headpipe, crankcenter, pivotcenter, pipeR and so on. By drawing it at half size every part fit completely. 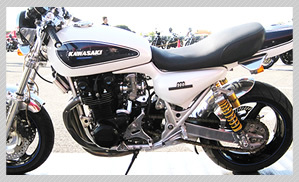 Wheelbase and caster angle are same size as Kawasaki Z1. I have many experiences to fabricate 3D with a 4 cylinder frame, but I had met with some difficulties, such as, the many points to weld, to smooth the welding bead, to craft the main frame while decorating it and to not imagine the completed frame easily during manufacturing. Designs are infinite in the world, but a good design is finite. It is important how we come across a good one! It is similar to treasure hunting. It took 4 months for drawing, 6 months for making main frame, 4 months for crafting swingarm, 8 months for frontfork, 2 months for tanksheet, 8 months for Front and rear fenders, steps, exhaust pipe, beltcover, oiltank, breakparts, coverparts, 6 months for polishing each part, those are what I summarized. I had dreamed of achieving 1st place at AMD and I had confidence at the beginning, but just before the end of completion I lost my confidence entirely. Those 4 years for me were an unpredictable adventure. 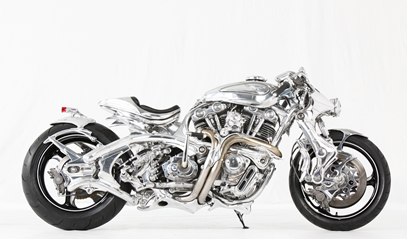 I, only me, had entered AMD world championship of custom bike building 2011 from 4 years before in my mind. It was really long, long journey to go home. Now a new long journey back to Sturgis has just been started. I have run Tavax Engineering by myself, no co-worker for over 25 years. I design, craft and build bikes all by myself. 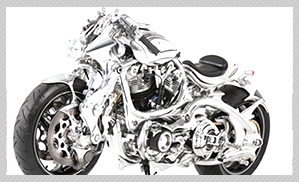 Mostly I have modified Japanese motor bikes with the exception of the Tavax2011V. It all started by making a frame from seeing an Egri frame when I was 18 years old. I decided to make a one-off frame by myself because Egri frame was too expensive for me as I was just high school student. I built my first custom bike when I was 21 years old. I opened Tavax Engineering when I was about 25 years old. 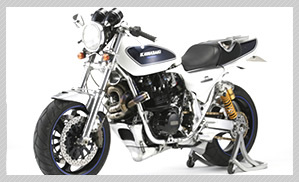 I produced custom bike named “Kawasaki Z1 aluminum frame” when I was about 30 years old. That was my first time to make a frame with aluminum. I have 2 more custom bikes made by myself now. You could see them in this site. Copyrightc TAVAX Engineering All Rights Reserved.